The ideal casual sophisticated setting exudes a welcoming vibe and offers relaxation, so an ottoman is surely welcome and expected. 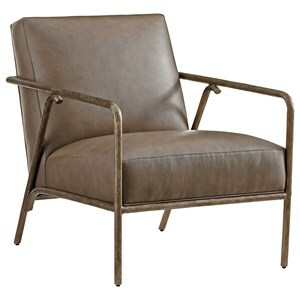 Our Hughes frames feature a new semi-aniline leather in a rich, versatile taupe with a soft hand, trimmed in a space, 1/2 inch natural finished nailhead. 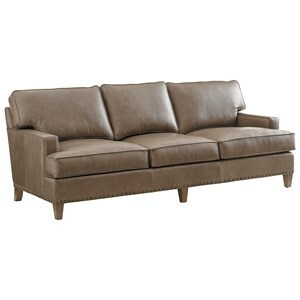 As part of our quick ship program, this frame is available only as shown with a matching sofa and chair. The leather however has been added to our custom leather offering, 9006-71 Grade 2. 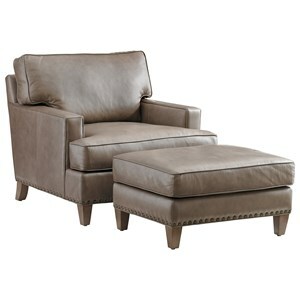 The tapered wood foot showcases our Harbor Gray upholstery finish. 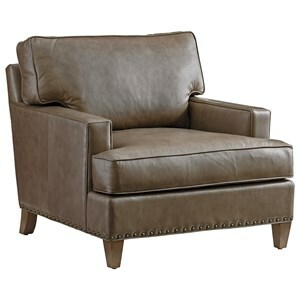 The Cypress Point Hughes Leather Ottoman with Nailheads by Tommy Bahama Home at Hudson's Furniture in the Tampa, St Petersburg, Orlando, Ormond Beach & Sarasota Florida area. Product availability may vary. Contact us for the most current availability on this product. The Cypress Point collection is a great option if you are looking for Transitional Transitional furniture in the Tampa, St Petersburg, Orlando, Ormond Beach & Sarasota Florida area.